Studio Katia December Release Blog Hop + Giveaway! Сегодня мы в блог хопе представляем замечательные новинки от Studio Katia! Моя первая открыточка с имитацией лун сделана при помощи двух негативных вырубок от ножика Loop. Самый нижний слой я затонировала дистресс чернилами. 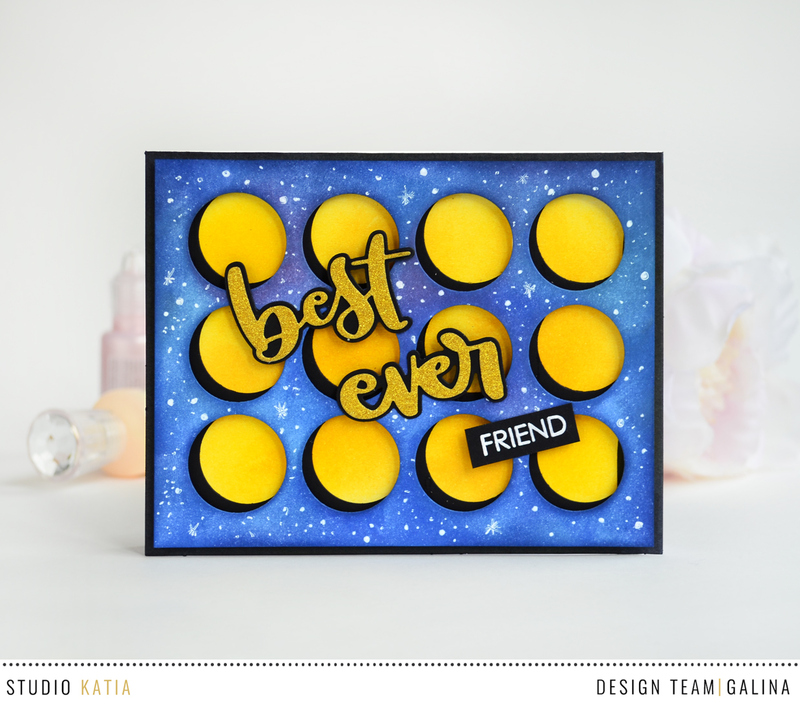 Today we have a blog hop to celebrate Studio Katia's new release! Надпись я сделала так же новыми ножиками Best ever - sentiment dies из черного и золотого картона. The sentiment I created using Best ever - sentiment dies with black and gold glitter cardstock. Так же вы можете выиграть сертификат на покупке у Studio Katia оставив свой коммент под этим постом, за другими бризами заглядывайте в блог SK! Leave a comment to be able win a 20$ to SK shop! I really like the color combos you used on your fun cards! "Best ever" is a great set. Fantastic cards!! Super bright bold striking colors and they are awesome!! Both cards are lovely but the first one really stands out! Brilliant work! These cards are gorgeous! I love the pops of color on the first one, and the little shaker windows on the second one are adorable. I’m not a coffee drinker, but I love your colourful and fun coffee theme shaker card. we had. The yellow dots glow. card add interest to the inserts. Great colours on each of your cards! Love the first one with the graphic feel! Love all of the dies and the stamps you used! Fabulous cards! Love your thanks a latte card!! I love how you use such striking color! It really is eye catching! Beautiful cards! Oh my!!! Two beautiful cards!!! Love so much your colouring!!! 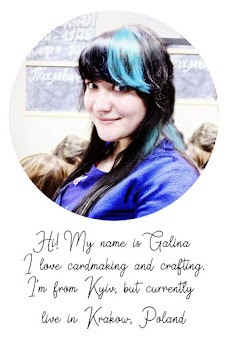 Both of these card are so pretty..
Hi Galina. Your cards re really great. 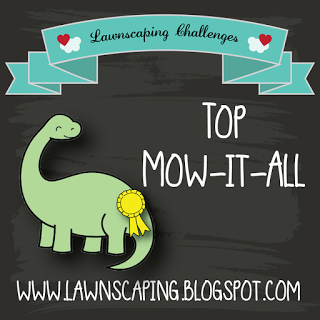 I especially like the first one as it is something that my 2 young grandsons would like. They are facinated by the moon phases so my daughter hand painted them on canvases to put around her oldest son's room (he's 5). LOL fantastic job on both cards. Love these cards but the second one is definitely my favorite. Love the little mini shakers! AWESOME cards, I love shaker cards! A duo of delight, Galina! Love the cheerful vibrancy of the first and the second? Sweet tooth tingling! Fabulous showcases! I love the vibrant colors on your first card. The shaker card is so fun. Great colours in your fun cards. Such fun and vibrant cards!! Cute cards. Love the colour combo on the shaker. Thanks for the inspiration. Wow! Love the offset of the dies! Great colors too! Your cards are bold and graphic....very pretty! Thanks for sharing and happy holidays! I know you said that the first one was meant to look like moons, but to me it looks like a marquee sign advertising the best friend ever, and I have some friends who definitely deserve marquee billing! Also, you mentioning the moons made me think how cool it would be to do a phases of the moon card with this set, so thanks for that little bit of inspiration as well! These are lovely cards and I appreciate you sharing them with us. Great card designs. I like the shapes and colors.